05-27-2012: KANSAS The upper trough was emerging into the Plains on this day, so there was quite a bit of hype and potential for intense severe weather and a tornado threat. SPC had issued a Moderate Risk, extending from north-central KS to MN, primarily for expected damaging winds and very large hail due to the steep mid level lapse rates and cold air aloft. However, mid and upper level winds, and consequently bulk shear, were not as favorable as much of the upper level support remained well to the north and seemed a bit out of phase for tornadoes and intense supercell storms. Still, we did get some nice storms. The set-up by the afternoon included an area of low pressure in northwest KS near the town of Norton, with a stalling frontal boundary to the northeast through eastern NE, and a dryline extending south of the low through central KS. We chose to target the northern end of the dryline, putting us into position to play the triple point/front to the north, or the tail end dryline storms to the south. Our route consisted of driving from North Platte, NE to Holdredge, NE for lunch and eventually setting up in Franklin, NE awaiting initiation. A mesoscale discussion came out at 2:58pm from eastern NE to southwest MN, while another mesoscale discussion came out at 3:10pm targeting our area along the dryline into KS and OK. A severe thunderstorm watch soon followed for areas to the north, while another severe box was issued for KS and OK at 3:55pm. Storms began initiating on the northern boundary at 4pm, but took until after 5pm to initiate further south along the dryline. These storms were in an environment characterized by MLCAPE of 2000-2500 j/kg with Effective Shear of 30-35 kts, but expected to increase into the evening. We first intercepted a storm near Smith Center, KS. Waiting right in its path, it kicked up strong outflow filled with dirt and, shortly after, started throwing golf ball sized hail at us! A couple hail stones near tennis ball size fell and we quickly turned the vehicles to face the storm so we would not break the side windows. After the storm passed over, we followed to the north, noting an intense hail core opening up on the storm to our west. Our storm soon weakened, so we dropped to the south to near Kensington, KS to take a closer look at the monstrous, white hail core with the storm to our west. This core was so big and well defined, it actually looked like a massive tornado and I believe there was a false report of one at that time. We watched this storm for a while as it did not change much, and left it to target the tail end storms firing along the dryline. As we got on these storms, each one moved off the dryline and weakened considerably. It was a strange pattern with each storm that did this as we kept dropping south to target the tail end storms. 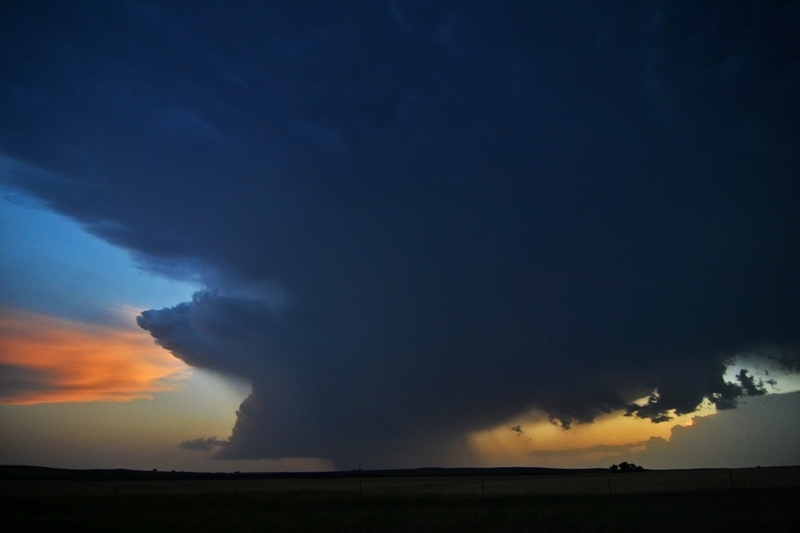 Although having great structure, each storm would croak upon moving off the dryline. 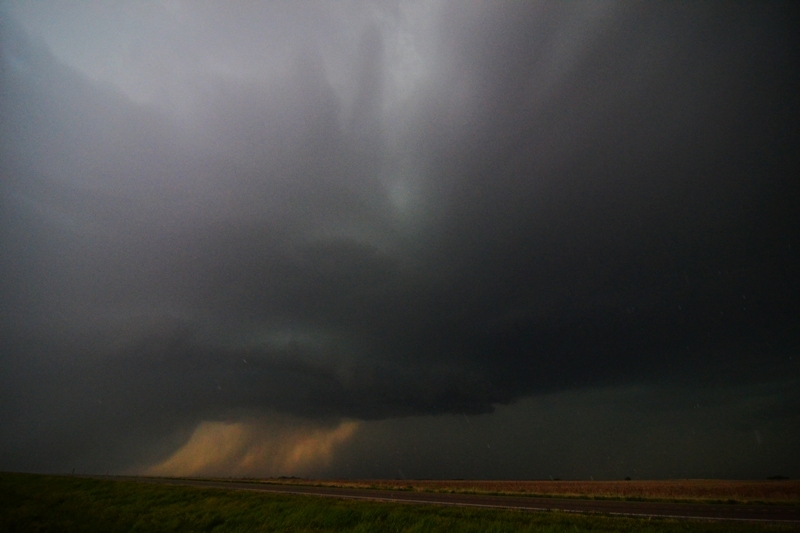 Our storm of the day moved up towards I-70 at us as we progressed east of Hays, KS towards Russell. This storm intensified near and after sunset, giving us a bout of hail and an incredible lightning display as we continued to stay ahead of it on the Interstate. It eventually took on more of an LP look to it with great structure as it was lit up by the lightning bolts at dark. We stopped a few times along our route to Salina to take pictures of this storm before eventually heading to the hotel for the night. Intense hail core on the storm near Alton, KS. Nicely structured supercell with core behind the base. Inflow into the storm with broad base, I believe near Stockton, KS. Supercell to our south, developing near La Crosse, KS. Another shot of the storm to our south near sunset. Our storm near Stockton, KS becoming LP and weakening upon moving off the dryline. Mothership supercell lit up by lightning with the SLT tour vans in the foreground near Russell, KS. One of my favorite shots I have ever taken. 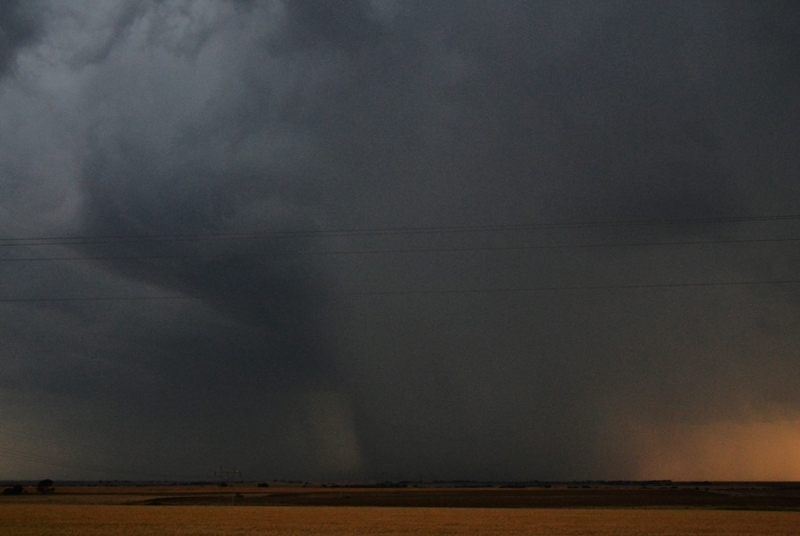 Storm lit up by lightning as we called it a night in a remote Kansas field.